Home Armor® E-Z House Wash Powerful Cleaning. No Scrubbing. Ridding the exterior of your home of stains caused by mold and mildew doesn’t have to be a big project. 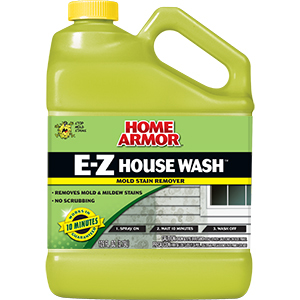 Home Armor® E-Z House Wash cleans exterior mold and mildew stains fast, with no scrubbing. It’s this easy: just apply with a garden sprayer, roller, tank sprayer or sponge, wait 10 minutes and rinse well. For heavy stains and soil, often found on the north side of structures, use at full strength. For typical stains, just dilute 1-part of E-Z House Wash with 3-parts water to cover 2,000 square feet. It’s guaranteed to work in just 10 minutes; won’t harm plants or landscaping when used as directed, and you can use it as a refill for our E-Z House Wash Hose End Sprayer to save money. Coverage: Approximately 2,000 square feet. Approximately 250 to 300 square feet undiluted. IMPORTANT: Carefully read all directions, notes and conditions prior to use. Test on an inconspicuous area before using. Wear eye protection and rubber gloves during use. Formula may stain clothes and shoes – dress appropriately. SURFACE PREPARATION: Use formula at full strength for tough stains or dilute with 3 parts water, one part formula for typical stains and dirt. Apply with a garden sprayer, roller or sponge. Do not use a high power pressure washer to apply. 1. Spray surrounding plants with water before and after use. 2. Start from the bottom and work upwards. Wait 5 minutes. 3 Rinse well with water. Heavy stains and textured surfaces may require light scrubbing and a second application. 4. Store the unused portion in a safe location, out of reach of children. Does the Home Armor® E-Z House Wash have bleach in it? Yes, the formula contains bleach to remove mold and mildew stains and has surfactants for added cleaning. Can I use this on my roof? Yes, the E-Z House Wash works on all types of exterior surfaces including roofs. Simply follow the directions for applying on surfaces found on the container. Will the formula harm glass? Yes, do not let the solution dry on glass. Be sure to rinse all glass thoroughly after use. Is it safe for plants and shrubs? Yes, just wet your plants before and rinse after use. Can I use E-Z House Wash to clean my patio or deck?